Help an aging Bosmer bring life back to his favorite grove. "Do you think they'll last forever?" An aging Bosmer named Hartmin brought his dying husband to a grove near Greenheart where they share memories from their youth. Collect the seeds of Nereid's Smile. This quest is gained from Hartmin, east of Greenheart. He talks about how he brought his dying husband, Mirilir, here to see the Nereid's Smile flowers that were there when they were young; but he cannot find any of the flowers nearby. He says there are some, but they are too far away for him. Offer to find them and he gladly accepts, and asks you to find some seeds so he can plant them. You must find two flowers; these can be found in towers further west towards Greenheart. 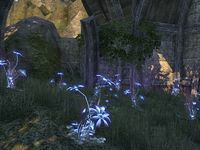 As you collect each flower's seeds, you will notice "ghost flowers" appear around the flower, and you can hear memories from Hartmin and Mirilir's youth. Perhaps this is a magical property of these flowers? Once you have collected both flowers, return to Hartmin; unfortunately, Mirilir has died while you were gone. Hartmin thanks you for getting the seeds and gives you some leveled gold as a reward. Hartmin was disappointed to discover that the flowers no longer grow here. He asked me to look for Nereid's Smile flowers nearby and if possible, to collect seeds for him to sow in the grove. Finishes quest I've collected seeds from the Nereid's Smile flowers. I should bring them back to Hartmin. This page was last modified on 15 November 2018, at 23:03.